Don’t be deterred by the ill-advised cover or the generic book description; The Dead Girls of Hysteria Hall is a smart, emotionally powerful ghost story with a ton of heart–and one of the best ghost-perspective novels, not to mention haunted house novels, that I’ve read in years. Why did I read this book: The end of summer puts me in a maudlin-type mood–but one thing I always look forward to in the fall are horror stories and books. When I received a copy of The Dead Girls of Hysteria Hall in the mail, I wasn’t immediately drawn to it because the book description seems so… blah, and the cover image pretty cheesy. But then I read a few super favorable reviews from people I trusted and thought, what the hell. There are some houses that contain dark secrets–loneliness, pain, greed, hate. The Piven Institute, for the care and correction of troubled females, founded in 1866 by Delia’s many-times-over Great Grandfather Maxwell G. Piven, is one such house. “Hysteria Hall” to the locals, the house is willed to Delia by her namesake aunt Cordelia–thanks to a bond the two formed a few years earlier over exchanged handwritten letters. Now, Delia and her family are moving into the house for the summer to appraise its value and get it ready for sale, but they have no idea what to expect of the recluse Aunt Cordelia’s home. Certainly, they don’t expect to find the sprawling estate and former mental institution for female patients, rumored to be haunted, when they drive up to Hysteria Hall. Delia is adamant that the family leaves immediately, after exploring the house and sensing that something really, truly isn’t right. She knows that something dark, and hungry, and evil lurks within the house–it’s too bad that no one believes her until it is too late. Now dead, bound to the house’s grounds for eternity, Delia grapples with the loss of her life and her family–and as the weeks and years pass, she vows to protect her family and any other living souls from the maliciousness that dwells within Hysteria Hall. It is up to Delia, and some of her newfound friends, to solve the mystery behind the house’s evil, and end its legacy of darkness, loneliness, and blood. How did I know this? I don’t know. But have you ever had someone believe something about you that you know to be untrue? And your sense of inner justice won’t let you simply surrender to the opinions of others? It was that way for me. […] In the end, we must always be the judges of our own conscience. So let’s start with the haunted house aspect of the book–because this is a standby in horror, and when it’s done right it can be terrifying. At the most fundamental level, The Dead Girls of Hysteria Hall *is* a haunted house tale–and not just any haunted house tale, but an abandoned institution haunted house tale. A former home for troubled females (more on unpacking that in a bit), we readers gradually learn that the house’s darkness has claimed many victims over the years–and that anyone who dies on its grounds is bound there for eternity. Enter young Delia Piven, our intrepid, unlucky heroine… who, in a Hitchcockian twist, dies in the first few chapters of the book, and becomes one of the house’s many haunts. 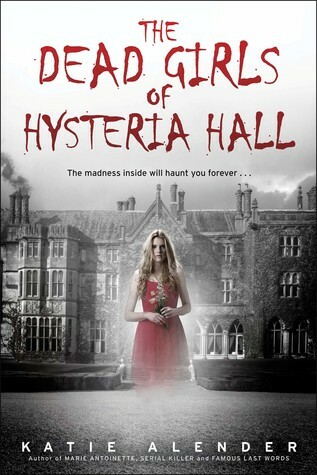 One thing that is so awesome and fascinating about The Dead Girls of Hysteria Hall is how the book plays homage to some of the great works in the haunted house body of horror fiction–from Shirley Jackson’s Hill House, to the insidious Overlook Hotel of Stephen King’s The Shining–all the while taking those familiar horror tropes an deliciously subverting them. Delia’s death and largely posthumous narrative is just one example–for another, this is a story where the main character instinctively knows that the house is bad news and desperately tries to leave, but she’s physically locked in. “Hysteria Hall,” Mom said, her gaze locked on the writing. “The word hysteria originated from the Greek hystera, meaning ‘womb.’ Female hysteria was a blanket diagnosis applied to women for everything from schizophrenia to having too many opinions. Beyond the subversive delightfulness of the story, there’s also the fact that the rules of ghosting are solid (i.e. suspension of disbelief, check), the writing is adept and peppy (despite some lurid language, the division between before and after death with some great foreshadowing is utterly entertaining), and the characters are awesome. Especially Delia, and her sister Janie. I crouched to pick up the bags I’d dropped, then started back for the front doors. Delia is a perfect, insightful narrator. Not only is she funny and clever (I mean, take the above for an example), but she’s also a wholly convincing teenager–she’s made a couple of bad decisions, sure, but she’s an honest kid who suffers from some basic insecurity and a dash of self-absorption. The fun part about her narrative is that there is a tendency to humor and, as she grows accustomed to the afterlife as a ghost, she also gains a new perspective on life, her family, and what really matters. This is especially true as Delia’s narrative explores the relationship with younger sister Janie–and as an older sister with two younger sisters of the same sort of age gap, I can attest to the genuine love-hate relationship that Alender builds here in this book. Janie and Delia are incredibly different–there’s the younger sister trying desperately to get the attention that has been foisted on the older, there is jealousy, there is resentment. But at its core, the relationships in this book are full of love–especially where Janie and Delia are concerned. I love the exploration of guilt, the trail of pain that death leaves in a family, especially for these two sisters–and the hopeful, optimistic closure to this grief. That’s really the kicker–The Dead Girls of Hysteria Hall actually doesn’t tread any new ground, but what it does is awesomely execute a pitch-perfect horror story from a teenage girl’s perspective–pre- and post-death. It’s beautiful and resonant and awesome and it made me want to cry at the end. There are no magical happy endings or rewriting of what has been done, but there is the powerful promise of hope–even the darkest endings can be hopeful. In other words, I loved The Dead Girls of Hysteria Hall… and I think you will, too. Rating: 8 – Excellent. I was going to give it a 7, but the awesome sibling relationship, the message about forgiveness and growing up and the pitch-perfect perspective throughout totally merits an 8. I loved this book and it will make my shortlist of notable books of 2015. I absolutely love horror, especially ghost stories, or stories involving any kind of haunting or ghosts. So when I came across this book, I was pretty excited to read it, because it promised a lot of awesomeness. this book made me want to read it over and over and never stop reading.???????????????????????? Wow, this book has some plot twists alright. A book to read alright. Guys!Plz dont purchase or issue this book as it is of no use.This book is just like wasting our money.I m having all types of horror story books,novels etc;but after purchasing this book I have wasted my money and dont want u to puchase it. I loved it and this is coming from a 11 year old. It was a amazing book. If you want to know more about Edge Browser then you will need to read here at https://rememberpasswordsinmicrosoftedge.net/, this will solve your problem.